Deauville and Cannes are casino-cities in which the scammers of the G8 \ G20 will decide on the wealth and poverty of humanity. But this time we won't be attending the party. Because it's not just there, it's everywhere we're confronted with facades or images that glorify the capitalist arrogance. Profits from the premade crisis are shamelessely shown despite their systematic use for delinquency and social control. Every movement, every word, every idea is recorded, pursued. Any attempt to live differently or simply to defend our personal rights, is violently suppressed by increasingly violent and concealed abuse of police powers and anti-terror laws, which can be applied to anyone. It is an ideological, economic, spatial, temporal, digital control ... Along with our passivity, the essential tool for the survival of capitalism. International laws give a solid implantation of totalitarianism today: capitalism and its profit to the economic and ecological disasters. The referendums are declared invalid. Elected officials are not serving the people. Demonstrations are violently suppressed by a highly-armed police, who unconditionally and naively defend a supra-national power, which uses them by mistake as their private militia. The traditional Democratic appeals are therefore inefficient, regardless of the country we are in. Some people dare to defend themselves, let's not remain mere spectators in the face of their courage! These countries which rise up and show us the image of a healthy revolution, do not want anymore dictators which are set up by rich countries, nor the corruption promoted by multinational corporations and international laws. The places where capitalism is happening daily, are all strategic places, right there under our windows. 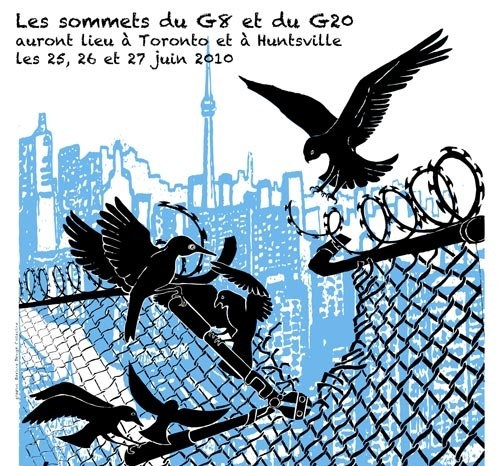 What will be discussed at the G8 is happening right now in front of us. Capitalism is unique and world-wide, global conflicts are many and local. Create, get it back, the social link! Only at a local level is it appropriate to administer our struggles and our own lives, using these links and the struggles as a prospect for a different model of civilization, this is now more important than ever! to protest at the summit sites, confronted with an armed machine of repression, serve for sure, some of us are certain of our expectations, but this limits our effectivity. For a stronger effect and a visual coherence, we propose that the actions of Thursday, May 26 are on local struggles and the 27th for Friday, focus on "social control". Capitalism is everywhere, so are we, and we attack where we see it !